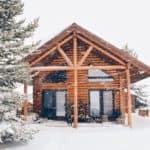 The cabin is surrounded by *so much snow. 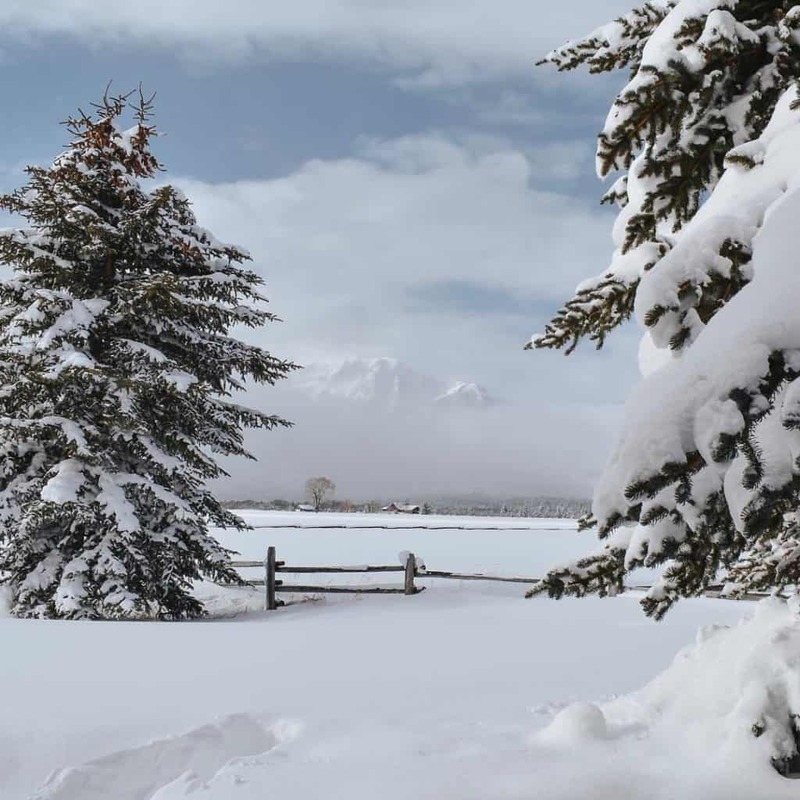 * In the front yard, the snow is up to my waist and I can’t walk out more than a couple steps. We have to snowshoe if we want to walk around the property. our front yard – if you look closely you can see a path where I tried to walk out in the snow & did not get far! And on one side of the cabin, the snow melt from our roof is piled up and almost completely blocks our living room window. Basically, there’s snow piled high everywhere! And it has changed the landscape of our days. One last note before I get started: for context, I’m also a stay at home mom. My husband works (somewhat) long days, and I stay home. We share a car, which sometimes I’ll take for the day — but if not, this is what a typical day at the cabin looks like. Good morning! This is when I wake up. A couple times a week Troy will wake up early at 4:00 AM and want to be nursed, and in those cases I’ll usually just wake up early as well. Husband wakes up. This is always much-anticipated because he starts a fire before he leaves for work! We have a fire going overnight, but by morning it’s burnt out and a little chilly in the cabin. 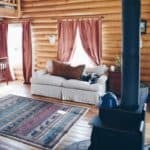 Troy has a heater and temperature control in his room, but my husband and I sleep in the cabin’s loft, so we primarily use the wood stove for our heat. One of my favorite parts of our winter days is peeking outside in the morning to see what the weather is like. Sometimes we’ll check outside and there’s a few inches of fresh snow. Or other times, on very cold days, it’s completely clear and the mountains are looking back at us. But it’s always beautiful; and the weather sets the stage for the day. Troy wakes up. I feed him and we read a book or play. These are my favorite moments with Troy. I try to start his day off by focusing on him for a bit, doing activities that help him learn or grow the skills he’s currently developing. When we moved into the cabin it was just one big room, but we added on a nursery. This has been a lifesaver! Our mornings start off in his nursery, where he has a shelf of books and toys. We have a large, energetic dog who needs to go out by this time. All the snow has been hard on her because there’s not many places for her to roam or do her business! I always do a sweeping check for any wildlife before letting her out. A few weeks ago we let her out and to our surprise there was a moose at the end of the driveway! Thankfully Kirby back inside, but I’d rather not have her meet a moose anytime soon. I try to keep the fire alive that my husband starts in the morning. My fire-making skills are not up to par yet… so if the fire goes out sometimes I struggle to get it started again. 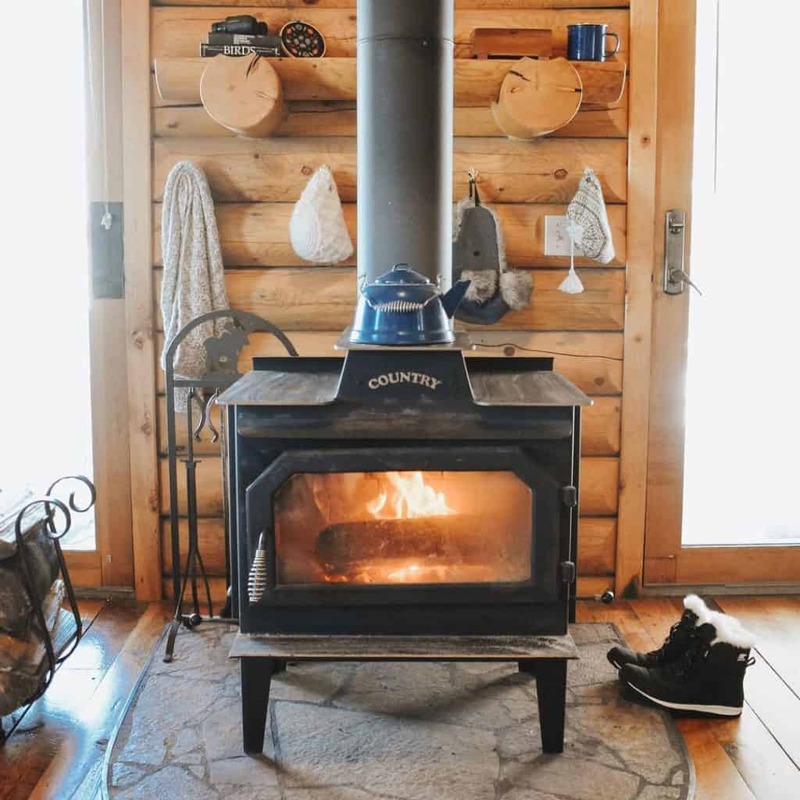 I usually bring in a haul or two of firewood every morning and keep the fire going for a few hours, which will keep us warm throughout the day. Especially on very cold days, it is crucial to keep the fire alive! We do have an electric heater if the fire goes out, but the wood stove is more efficient very cold days (10 degrees & below…). And this can be most days, with some days that are even sub-zero. 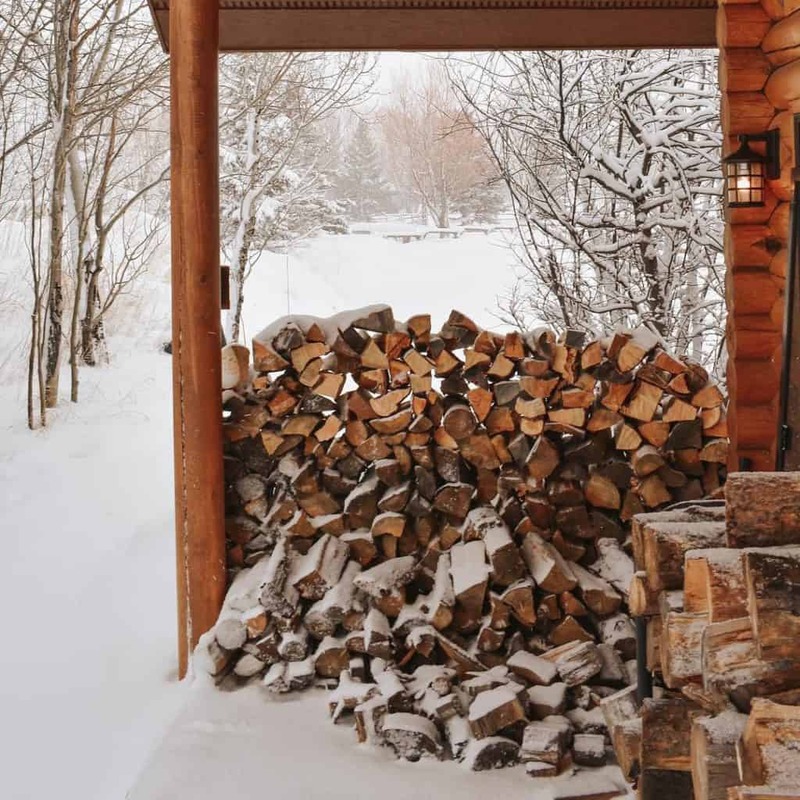 firewood stacked high on the porch. we’re going through it fast this winter! I’ll grab another cup of coffee and set up at the table for some work. Any writing for the blog usually happens in the morning, when I feel like I can focus the best. At this point, I’ll catch up on emails or do other various tasks to make sure I’m caught up on work. If it’s not too cold and we’re not in the middle of (one of the many…) snowstorms, we try to get outdoors. I’ll bundle Troy up for a walk in the neighborhood, even though these walks are usually short. Honestly, I don’t feel like we’ve figured out how to make the most of our winter days yet. My whole life until now I’ve lived in Texas and our winters were a warm 30 degrees 🙂 So when most of our winter days here are well below that, I feel unsure of whether it’s a good idea to take Troy outside or for how long! He’s 9 months old now, so I feel like next winter we’ll be able to explore the outdoors more. Next year he’ll be walking and it will be fun to play with him in the snow. At this point, he basically looks like a giant marshmallow all bundled up in his winter clothes and then strapped into his carrier. I spend some more time with Troy in his nursery, playing or letting him explore. This week he started crawling, so our play time mostly looks like me trying to keep up with him! At this age, it feels like Troy is doing something new every day, which is fun to watch. He also started saying ‘ma ma ma,’ or ‘maaaaa!’ which melts my heart! Troy eats his dinner. I feed Troy and then he is usually happy to bang away with toys in high high chair for a few minutes. sometimes Troy will cooperate while I cook dinner! I cook dinner. While Troy is next to me in his high chair, I’ll get dinner ready for when Jonathon comes home. This is actually one of my favorite parts of the day. I hardly ever used to cook before we moved to the cabin, but now I cook dinner most nights. In winter, there’s something extra comforting about having a warm, home-cooked meal. I should add here that sometimes our afternoons (and days) are much more chaotic than this. There’s days that Troy is grumpy, things don’t go according to plan and I don’t cook dinner. Especially in winter, when cabin fever can set in, I try to give me and Troy both plenty of room for grace. 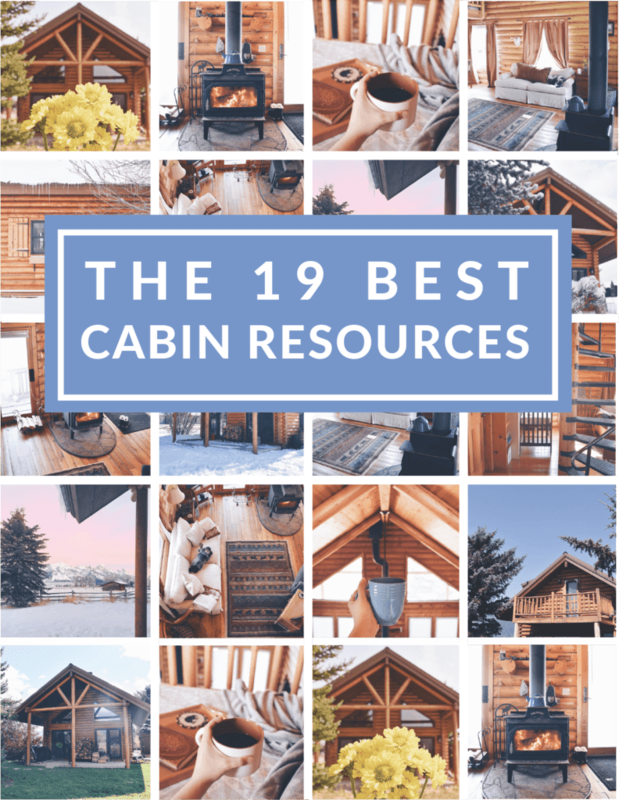 If the cabin is a mess or Troy is cranky (or if I get cranky… :)), it’s OK. I love routine, but try to be more sensitive to what we both need day to day. 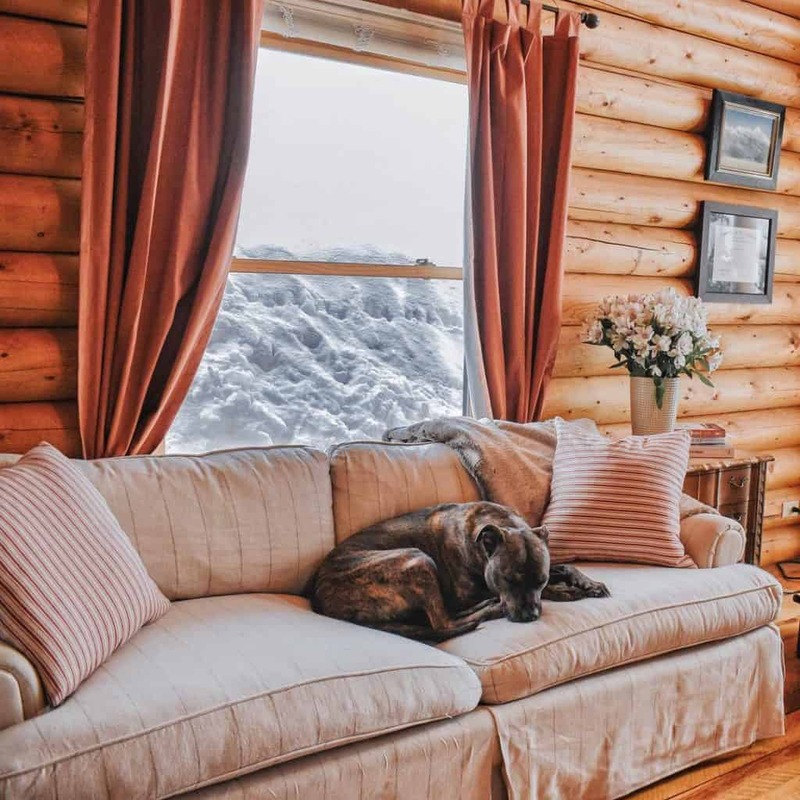 Sometimes that looks like things around the cabin don’t get done, or we sit down and watch a TV show or I take some long moments just to hang out with Troy. Jonathon comes home and we eat dinner. He’ll start a fire for the night and bring in more firewood. We’ll all hang out together until Troy goes to sleep. Troy goes to bed and Joanthon and I usually watch a TV show or two before going to bed ourselves. And that’s what a typical winter weekday looks like! Our days are constantly evolving, as Troy grows and his schedule is ever-changing. The weather has a big impact on our days as well. It makes sense to me now, but I did not expect the weather to have such a big impact on day-to-day cabin life. There’s lot of elements that change everyday in our routine, but I am very fond of those that stay the same right now: waking up to lots of beautiful snow, a warm fire, lots of play time with Troy, getting to work on some new work projects, and family dinner time as soon as the husband gets home. 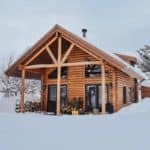 Is cabin life in winter what you expected? Drop a comment below to let me know!